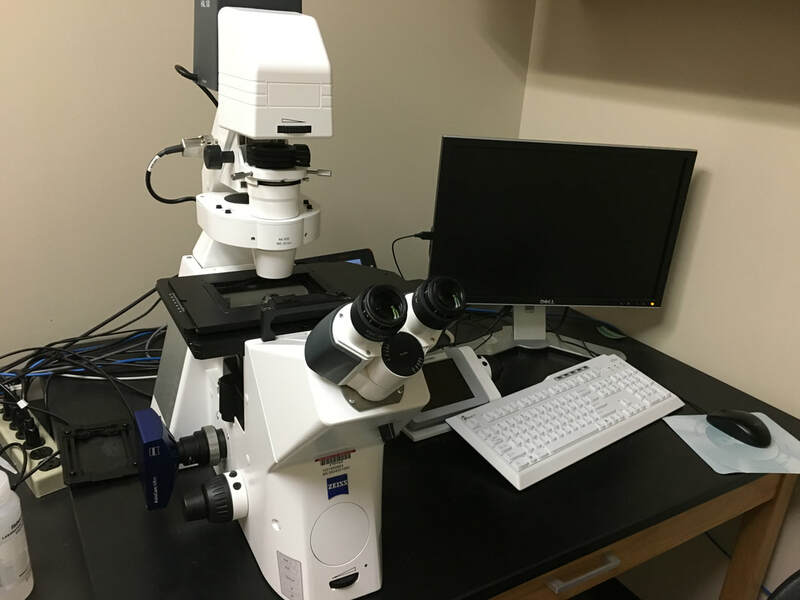 Inverted microscope for imaging fixed or live cells and/or bacteria. Equipped with X-Cite lamp for fluorescence, plus standard DAPI, GFP, dsRed, CFP, and YFP filters. Objectives: 10x, 20x LWD, 40x LWD, 100x oil. Features: Three stage inserts (universal, 96-well plate holder, and temperature-controlled environmental chamber for 35mm dishes and chambered coverglass). 20x and 40x long-working distances lenses for viewing cells through plastic culture dishes and plates. 100x phase contrast lens for easy viewing of bacteria. Same software (Zen) as the Zeiss LSM710 confocal. Faculty and students who wish to use the microscope should follow the instructions in the New Users Guide. Training takes 30-60 minutes. Users are encouraged to bring their own samples to the training session. If none are available, prepared slides will be used.